I got 2 because Jeff' s looked so awesome. I'm very pleased . That is a neat looking cap. Jeff's looked so awesome mostly because Jeff was wearing it. Beauty is in da eyes of da beholder. And dat guy needs ah new hat!!! I got a new hat, and who is that rough and tumble lookin dude? I got thinkin , allot of guys here may never check the whole forum for things like FF hats etc. Like me I normally just hang around in saw mills and milling . These are very fine hats I hope to see more guys ordering ! This is a great opertunity to support everything we love here . Personally I think I will be placing another order . Got mine and I must say it is one of the nicest hats that I have ever had. The material is extremely soft and it feels like it it is broken in from the start. The embroidery is just amazing. 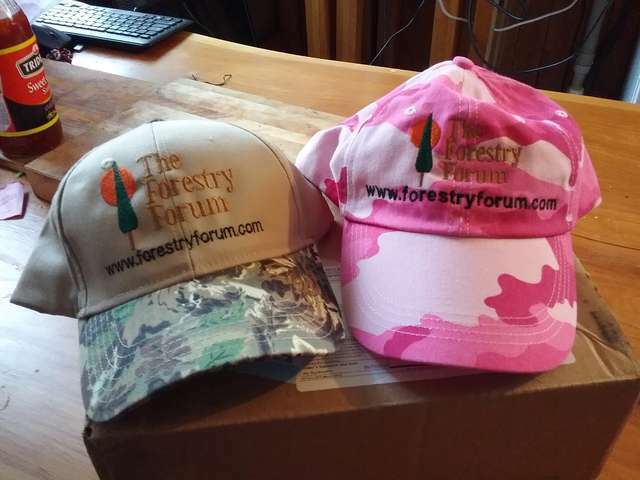 Thank you Kitty for helping us nohats become official havehats members of the Forestry Forum. We ordered new summer hats from Kitty, their really nice, great work on the embroidery . At home with our new hats. And a close up at the puter. Much more photogenic than that one of the dude Magicman stuck on here. Hey,Hey,where did that mighty fine looking couple come from? Thank you for the compliments...very pleased that you are happy with them! A huge thanks to Kitty for a smooth and hassle free process. Our hats arrived down under today. We are looking forward to road tripping with them over our summer break. Thank you LIL....so happy they reached you safely! Shirts will be available at some point in time, just not at the moment. Once Dave and I get relocated, then we will have more to offer in the garment line. So, hats are it for the time being. Just now, Dave and I are in the midst of downsizing and selling our property to relocate in the hopes of retiring from the corporate environment soon. I hope you will have patience and understanding with me as Dave and I try to get through this property selling thing....who knew it would be so difficult?